It is great as a culinary spice; my favourite dish with it is chicken. Rosemary (Rosemarinus officinalis) has a great smell and serves many functions. Rosemary is a green herb with needle like leaves and blue flowers. 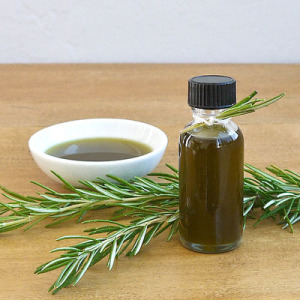 Like all herbs, even Rosemary can be incorporated in your hair care regime in numerous ways. The herb stimulates hair growth, fights dandruff and gives your hair a delightful smell. You can use it either dried or fresh. Other than tasting great, rosemary tea can be used as a hair rinse. It is good at combating dandruff and giving the hair a glossy look). To make the rosemary tea, pour a cup of boiling water over three teaspoons of rosemary leaves (fresh or dried), cover it and let it stay like that for ten minutes. To prevent hair loss, drink two cups of rosemary tea a day. It is good for stimulating growth especially after an event like chemotherapy. Mix 25g of fresh rosemary with a litre of cider vinegar. Let the mixture steep for two weeks then strain and store in a glass bottle. You can then add two tablespoon of the mixture in the final rinse water when you wash the hair. For dandruff, massage rosemary vinegar into the scalp before you wash it. Pour some boiling water over the rosemary leaves, cover for 15 minutes then strain out the herbs. When the water is warm, hold your head over a basin, pour it over your hair as the final rinse. Take the water from the basin and pour it over your hair again. Repeat this until there is no more infusion of rosemary left. • Slows down hair loss and prevent the appearance of gray hair since it darkens hair. • Prevents falling off hair during brushing.